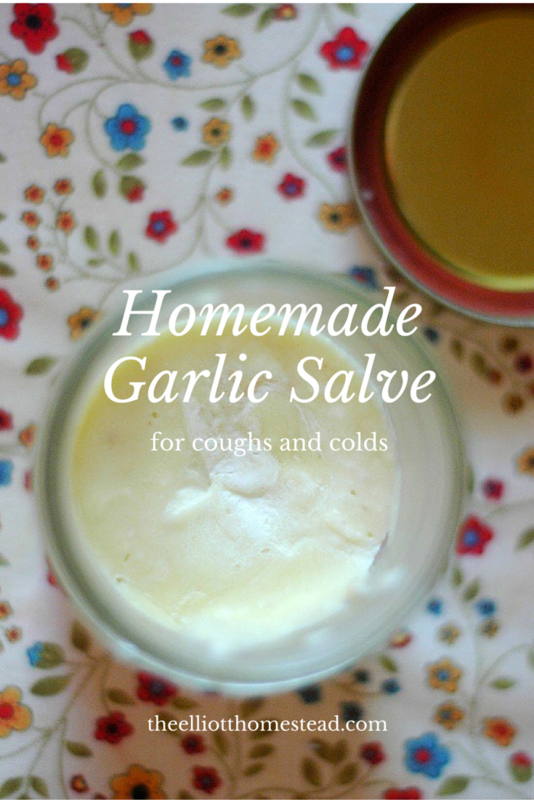 Homemade Garlic Salve for Coughs & Colds. You know those moms that can lift up a car if their child is pinned beneath it? I’m totally one of those moms. Well, I think I am anyway. My children, praise God, have never been pinned under a car to test the theory – but I know that blood boiling feeling I get about protecting them and loving them. So, assuming they were pinned under a car, I am positive I could absolutely dig deep into the very core of my being and inch by inch, lift it off. Ain’t nothin’ standing in the way of this Mama Bear and her cubs. And thus, when the hobbit came down with a cough and cold last week, it instantly brought out that gladiator inside of me. Note before we begin: This is one of my more popular posts. And because of this, I actually created a downloadable recipe card just for readers of this post. That way you can refer back to it next time you need it! If you want it, You can click here and I’ll send it right away! Sure, it was just a small cough and cold. But still, seeing that sweet pitiful look on his face, and hearing that sweet little cough, and feeling his warm little cheeks on mine – it just broke my heart. I pulled out my guns and prepared for battle. I choose to save Doctor’s visits for very, very important matters and I knew that due to the nature of the cough, I would try my hand with home remedies to start helping first. So after a little research in a home-remedies handbook I picked up in a second-hand-bookstore a few years back, I decided to rely on old faithful: garlic. Raw garlic has incredible health-boosting properties, but obviously we can’t request our infants eat a clove of garlic. Heck, the hobbit doesn’t even have teeth! Hence the salve. Isn’t it cool? The health-boosting properties of raw garlic can be absorbed through the skin! But regardless of its pungent nature, I cannot stress how wonderfully this treatment helped. After only a few hours, the coughing had lessened. After 24 hours, the cough was all but gone, as was the fever and pitiful baby. And after that 24 hours, Owen was completely normal – perky, bubbly, smiling, and frickin’ cute. Why am I continually amazed at the incredible power of nature? I should know by now – it works wonderfully! But back to what’s at hand. Combine the ingredients together in a food processor or blender. Blend for about 3 minutes, or until it is a perfectly smooth whipped butter of sorts. You may need to scrap down the sides of the food processor to get all the garlic completely worked into a paste. Put into a small mason jar or other container and refrigerate (you can use it right away, but refrigerating helps it to set up and keep long-term). – Rub onto the soles of baby’s feet. Apply generously. Put socks on to help hold the salve in place. – Rub on baby’s chest. – Repeat every 2-3 hours until condition improves. I only used the treatment about 7-10 times total – Owen is now sleeping for 12 hours and I didn’t want to wake him to reapply the salve, so I left him alone through the night. But the next morning, though he still had a slight cough, it greatly improved further after a few more morning treatments. And by the next night, he was almost completely clear of all symptoms. After he was feeling better, I stopped rubbing it on his chest (and yes, he totally smelt like a roast Italian chicken dinner for a few days) and only put it onto his feet. That sweet, little stinky hobbit. What would I do without him! It’s a difficult thing as a mother, to watch your little one be ill. But I’m very thankful I now have a batch of this salve made up in the fridge to start using immediately when I suspect a bug coming on. Garlic is incredibly powerful gun for the home-remedier (how do you like that word?) to have in their holster. Combine the ingredients together in a food processor or blender. Blend for about 3 minutes, or until it is a perfectly smooth whipped butter of sorts. You may need to scrap down the sides of the food processor to get all the garlic completely worked into a paste. Place in a glass jar. Rub onto the soles of baby’s feet. Apply generously. Put socks on to help hold the salve in place. You can also rub on baby’s chest. Repeat every 2-3 hours until condition improves. As we wrap up: I didn’t want you to miss this. This is one of my more popular posts.I actually created a downloadable recipe card just for readers of this post. That way you can refer back to it next time you need it! If you want it, you can click here and I’ll send it right away! « As the soup flys. I would love to know how you cured an ear infection too! Thanks for the recipe. Perfect! Just what I needed after needlessly suffering through a terrible cold for more days than I’d like. Thank you! Your little man is downright smoochable, I have to admit I was a little sidetracked by his cuteness. 🙂 The same thing happens with my little Leah…she is a great distracter. Looks like your rubbin’ off on me with our unique word-making ability. Thanks for the salve recipe, I’ll definitely be using this the next time the cold bug hits our house. Can you please share the name of the home remedy book? Thanks! And your little “roast chicken” is adorable! When I make this salve I blend it up n let it sit a little than i strain the chunks of garlic out. Love garlic salve for sick children! How do you strain the garlic out, especially since the coconut oil isn’t runny? My baby had been running a fever for a day and a half, I made this and his fever broke 30 minutes later. My husband and I were shocked. I was so happy I came across this. He did smell like a roasted chicken, but it was worth it. Thanks for sharing. I love this blog. Daughter is a sickly child and gets febrile seizures with her fevers. Because of this, I do generally run to the doctor.. I really want to try this out on her now. I don’t go anywhere away from home (overnight I mean!) without garlic oil capsules. This recipe sounds fantastic and want to try it, but I have always been so amazed at how quickly garlic oil can break a fever and bring a sick baby/child through! Rub it all over their feet and now, per this advice, I’ll be rubbing it all over their chests too lol! Your little hobbit is adorable. I’ll be sharing this on FB this week. THANKS! Awesome! I hope it works well for you! And thank you 🙂 We think he’s pretty scrumptious too. How old is your baby? I’m wondering if this is safe for my 10 week old. Yes, it would be safe. Dilute it heavily if you’re worried with more oil/less garlic! Is it ok for a 10 month old? Awesome recipe and a very very cute baby! Thanks so much for sharing. I’ll try it on my children. I myself add some fried garlic into my own food during cough and cold and it seemed to work wonderfully. Thanks to God’s gift to us. Baby is a sweetheart! Glad this worked so well. First I’ve heard of it as a salve. I’ve used it successfully around the ear for ear aches, with olive oil and massage. Is the Lavedner Oil essential to the effectiveness? I don’t have any. We don’t need it at the moment, but if the lavender oil is not essential and just to cover up the “sweet, stinky” smell, then may I skip it? Love garlic! I don’t have any lavender oil, but I have eucalyptus, would that work? Eucalyptus isn’t recommended for children under 6 years-old; it can slow down their heart rate and breathing. So, if it’s for a child, then no eucalyptus; if it’s for a child over 6 or an adult it would be safe to use. No sickness in my home yet. Can I make this ahead of time? How long will it last in the fridge? Thank you so much! You have inspired me and given me confidence about taking care of my babies naturally on many different occasions. I would like to know how long it last also. Hubby is sick and would like to have some in hand just in case the kiddos get it too. Thanks! Okay. Writing back again. A cold has struck, like I thought it might. I made this up, minus the lavender on Sunday. By Tuesday it stunk like crazy. Can’t explain. Not garlic. It was on the counter over night, then in the fridge, but it was too hard to apply, then back on the counter. It didn’t smell rancid, just some nondescript awful. I use Tropical Traditions Expeller Pressed Organic Coconut oil and organic garlic. How long is this supposed to keep? I assumed it would be good for at least a week. Vieve, that’s weird. I’ve never had this problem with it at all. I’m sorry I can’t be of more help! I tried making it yesterday. Minced the garlic, maybe i added too much of the lavender oil. It never turned into a salve, was much runnier than that at room temperature. I wanted to use it for myself last night as I have had a bad cold and cough for the last three weeks. It stank to high heaven (or chicken heaven) and it was overwhelming for me to be breathing it all night long. Reapplied it twice during the night, but it was more like applying baby oil than vicks vaporub. Definitely going to have to wash my sheets and duvet cover as the garlic smell got into everything! I like the idea of the salve, but not sure why it is so runny…. Sounds like the coconut oil was too warm. Maybe try refrigerating it next time so that the coconut oil with solidify and then just using a small amount of the hardened salve that way? Can anyone help? How much is a 1/3 cup of coconut oil? I’m in the UK. 1 cup is about 200 ml, so 200 divided by 3 is 36.7 ml. I was hoping you might be able to point me in another direction – my daughter is allergic to milk, soy, nuts, coconut and whole wheat – is there ANYTHING we can safely substitute for the coconut oil? We steep garlic in olive oil, cool it, and store in a dark place at room temp for the same effect. Thank you soooo much made this last night/early this am and my 8 month old breathing is completely clear!!! No.antibiotics!!!!! Will continue to use tomorrow just incase! Can this be used on newborns if they get sick? Like 8 weeks old? And how long will it keep in the fridge? How vital is the lavender oil? DH is allergic/sensitive to it-it triggers asthma attacks in him. Will it work as well with out it? Thank you so much Shaye for posting this recipe! My 2 1/2 year old son got a nasty cough/cold and could not stop coughing yesterday to the point that he was throwing up and could not sleep. I made this garlic salve, and 24 hours later, he is resting and barely coughing. After a doctor’s visit today, they said there is nothing they can do for him, just a nasty cold. Thank God for nature! Thanks again Shaye and blessings to you and your family! Yes! Perhaps dilute it a bit more with coconut oil. I think I remember this post.I put crushed garlic on my 10 yr old socks two days ago, dried eucalyptus on his shelf, and bought a new plug-in diffuser w/ essential oil in it because I was desperate to rid of his cough naturally. This is of course w/ bath, honey/lemon, lots of water, tea, and bone-broths. He is on the mend now and what makes me happy is that even at his age, he doesn’t mind that I try those remedies even if his room smells like an Italian Restaurant at the moment. 🙂 Great post and love your ideas for so many Mom’s that may try this and be thankful for it. can i use eucalyptus oil ,mela oil or any oil will do? Hi Shaye, I was wondering if you have heard of ‘ Hot and Cold compresses” for chest congestion? This is another good healer, remember to protect delicate baby skin. Love your remedies, and, the fact that you share these wonders with us. In your post you mentioned pink-eye as well. For the life of me, I can’t imagine how you treat that with garlic?!? Am I crazy or is that not what you meant? 🙂 But seriously, I have one that looks like he’s coming down with it on the back of a nasty cold…any helpful info would be greatly appreciated! I don’t have and lavender oil, is there anything else that I can use instead? I’d just leave it out. I can’t wait to try this. How long does the garlic salve last if refrigerated? 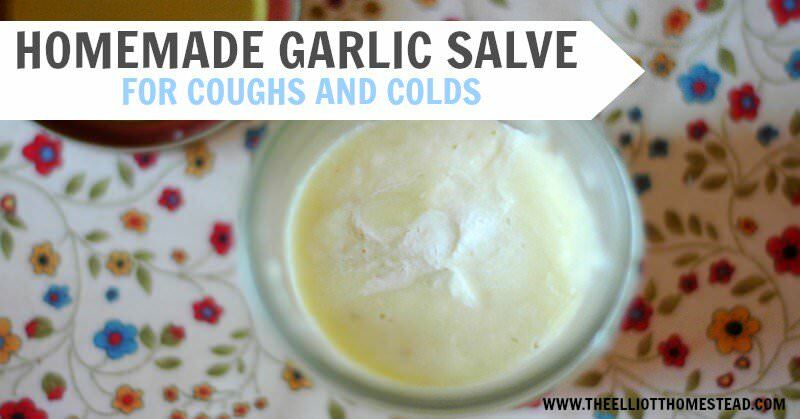 Garlic salve lasts a couple months. My son has had a cough for a few days and now his eyes are getting crusty and I’m worried pink eye is developing. I have been applying the salve on his chest and feet for the cough, but where do I apply it to stop the pink eye from developing? Or will it work just because the garlic is running throughout his system? Thanks! I’ve never used the Garlic salve for pink eye so can’t say for sure. My 10monts old baby down with flu, cough and FEVER, can i still apply the garlic oil on her sore and chest despite with fever? Great Post! I am kinda new to your blog, just found you about a month ago and loving it! We are a ghetto version of suburban homesteaders with a garden our neighbors hate, a small front yard orchard and 10 chickens we love! We use natural organic homemade – for almost 5 years now, solely. My boys are 4 and 2 and have been raised without modern medicines thus far- with much great success. We use zero chemical or commercial products for body or cleaning. I love these recipes and gems! I have found the best and fastest remedy for all infections and respiratory issues, is bee propolis. Mine are old enough that I can mix it with honey because we use the extract and you never give it straight, but they also make powders and it could be mixed with other things. We also make garlic syrup- which they love. For infections of any kind, or illnesses, we begin propolis 2-3 times a day with a syrup/honey spoonful and most never catch on. Its fast! It has zero adverse reactions that I have found and its fairly inexpensive and also anti-viral! I love telling all natural moms- its helped us through some potentially rough ordeals. We have a natural body products company that I have done some extensive research for, specifically ragarding raising boys, I was cautioned at the onset about certain EOs that have been tested and shown to have some potentially strong adverse reactions in boys- Lavender EO is one of them. So much so that I almost always substitute Tea Tree or Rosemary for my boys. There is some published info regarding this on the internet. Just wanted to throw the caution up for your precious little man. Thank you so much for this wonderful blog and view into your beautiful family and life! I enjoy seeing the updates every day! I believe Eucalyptus and Rosemary are also contraindicated for children under 10 and 6 respectively. Is this correct? Thank you Tara for all of that very helpful information. My daughter is 6 months is it safe to use on her? Or is she too young? We have been using sliced garlic on our thirteen children for 16 years now but last week my wife made your recipe for our 6 year old when he woke up scared and screaming because of the heavy ingestion in his chest. It helped him breath and sleep all night and he was much better the next day! We are using it on five of the grand kids who were very sick also. It’s terrific! Thank You for sharing and may the God of Israel bless You richly! Great post! Your little hobbit is adorable. Isn’t is wonderful how God has given us an amazing medicine cabinet growing out of the dirt?! I’ll have to try this on my husband if he starts to get another episode of bronchitis. How long will the salve stay for in the fridge? Will it go bad at any point? It’ll stay good for months! Does this help with runny nose as well? My daughter had a runny nose and a cough. Thanks for the recipe! All the other recipes I searched use Eucalyptus and/or Peppermint EO, which I am not cool with using on my baby. I may even omit the Lavender from this one (just personal preference). Think I will also try adding some beeswax to firm it up. I’m stoked to try this, glad I love garlic so much!! Hi, I’ve been using this salve on my 9 month old for two days now & she is so much better, thank you! Her fever went away after the first full day of using it and she had lots more energy. Now she’s getting rid of lots of mucus, yum! I made the salve on Sunday, now it’s Wednesday, and I haven’t been refrigerating it. My house hasn’t gotten warmer than 66 degrees F. It smells fine (garlicky, coconutty & lavendery) but should I be worried it’s bad? Someone’s mentioning of botulism got me scared. Thank you for your help! Nope – it’s totally fine at room temperature. I’m glad it worked! Can you use this safely on a three month old? Ty btw for posting this great reciepe! God bless! Is it safe to use this on my one month old? We are trying this tonight. Will applying it directly to the skin cause a bit of ‘garlic burn’? I am wondering if anyone knows if this would help for whooping cough? I applied this salve on my 10 year old son’s feet and chest a total of 3 times. After the 2nd application he said “Mom I think stuff is working, I feel almost all the way better”. Great news for one tired mom. He stinks of garlic but absolutely better than the cough that was beginning to settle deeper into his lungs. Try it! It stores great in the fridge. Hi going to try this salve today. I see you mention to leave out lavender oil if you don’t have. But can you lemon? Is that a decongestant for babies (I have a 4 y/o and an 8 month old baby) thank you. Would you be able to use minced jar garlic with the same effect? I chopped my garlic and then melted the coconut oil over low heat on the stove. Then I just stressibg the garlic out and poured the oil into a glass jar. Can I use eucalyptus oil instead of lavender oil. Hi, This remedy sounds very helpful. Can I try this on my 1month old baby?? Shaye, this garlic salve has been a staple in our families home since I came across it on your blog a few years ago. I never worry when the kids come down with a cold now. I dont always have Lavender oil on hand and it still does the job. The adults even use it. My parents ask for it also after seeing how it has worked – This stuff is amazing! Thank you thank thank you! Shaye, just wanted to drop in again and say that this garlic salve has been a staple in our families home since I came across it on your blog a few years ago. I never worry when the kids come down with a cold now. I dont always have Lavender oil on hand and it still does the job. The adults even use it. My parents ask for it also after seeing how it has worked – This stuff is amazing! Thank you thank thank you! Is it okay to double the recipe? I ended up having it do that because my nutribullet would not blend such a small amount (it was below the blade). Also is it kept in the frig? And how long can you keep it for?